I received free tickets to this event. All opinions are 100% my own. A few months ago I saw the trailer for Breakthrough, and I balled. I'm a mom of two girls, and I can't even imagine the pain this family went through. I knew I would cry during this film, but I knew I had to see it since Breakthrough is a true story. 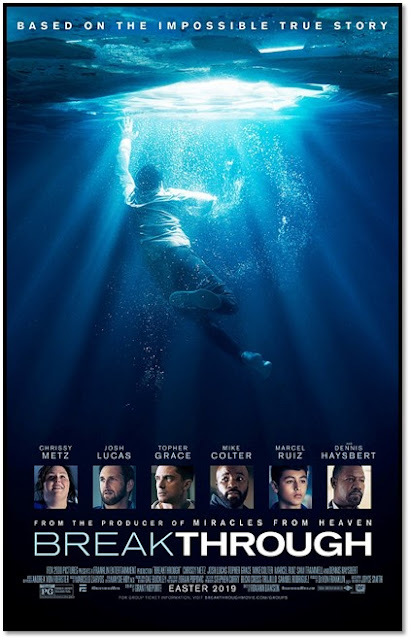 Starring Chrissy Metz, Josh Lucas, Topher Grace, Mike Colter, Marcel Ruiz, Sam Trammell, and Dennis Haysbert. Sometimes, I find some Christian movies are cheesy. This isn't one of them. My family and I attend movies usually weekly, and this was one of the best films I've seen in a while. I didn't know quite what to expect from This is Us star, Chrissy Metz but she blew this role out of the water. I felt her pain that she felt over her child, I was on this journey right along with her. Her acting was superb. I'm getting all choked up just thinking about it. The surprise in the movie for me was Topher Grace from the 70's Show. He played the pastor in the film. I really enjoyed his character. Well, I enjoyed him being poked at and standing by this family. I don't want to give too much away. Go see this movie. I will be taking my husband and kids to see it. It's a beautiful movie to see around Easter. I give it 4.5 stars out of 5. Don't forget your Kleenex!